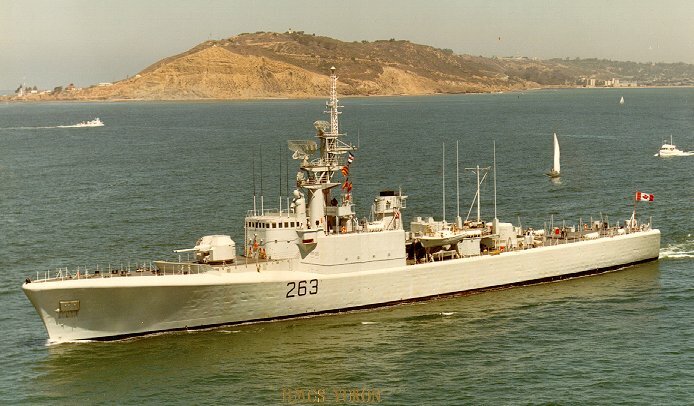 The HMCS Yukon was a Canadian Mackenzie Class Destroyer launched in 1963. Yukon is 366 feet long and has a beam of 42 feet. 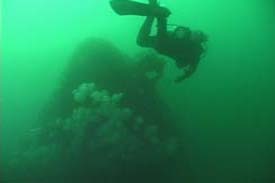 The vessel was sunk as an artifical reef off San Diego, CA. on July 14th, 2000 and is the premiere dive in "Wreck Alley". 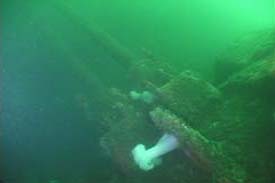 The 2.380 ton vessel was extensively prepared for divers by removing hatches and cutting holes in the hull. Unfortunately this caused the vessel sink the night before its planned scuttling and resulted in her landing on her port side in 105 FSW. 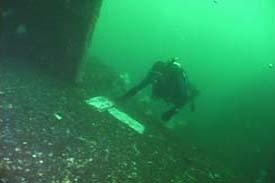 Many of the access holes are labeled on the wreck and dives can be planned with published deck plans. 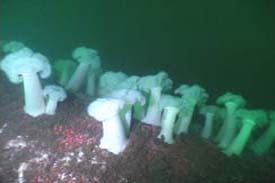 (l) Bow of HMCS Yukon covered in white biota-anemones; (r) White biota-anemones are rare but found on the Yukon. 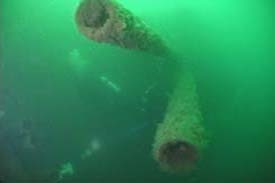 (l) Barrels of the forward turret (they are actually light poles); (r) View from above the turret. 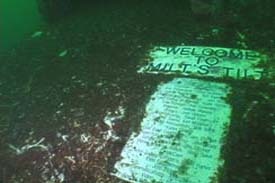 (l) The entire wreck is marked with location signs; (r) Position "Milt's Tilt".